Homemade bird feeders do not need to be created from wood and nails, they can be created from anything including nature. 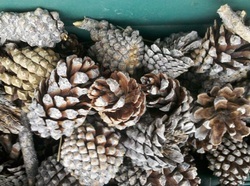 Pine cones make great feeders and they are so fast to setup. Where I live Blue Jays really love this treat and they look so natural. But almost all backyard birds will flock to this treat especially in the winter when food is scarce. It is a good source of protein for them. Lots of pine cones, the more open the better. Ribbon or heavy duty string (for hanging them in the trees or bushes) Remember you could get larger birds landing on these pine cone feeders so make sure the string or ribbon is secure. In a large bowl mix 1 part peanut butter to 2 parts bird seed. This will be a bit pasty but that is what you want. For example mix 1/2 cup peanut butter to 1 cup bird seed. You can increase your amounts based on how many feeders you want to make. Tie your ribbon around the smallest end of the pine cone making sure it is secure. Then with a spoon or your hands start to fill the petals of the pine cone with the mixture, then hang outside on different parts of the tree or shrubs and watch your birds flock to the treat. These are fast homemade bird feeders using nature as the base! You can refill them as needed too!